If you're interested in drawing and painting plants, sooner or later you'll have to tackle leaves. They're everywhere, and they come in a remarkable variety of types. 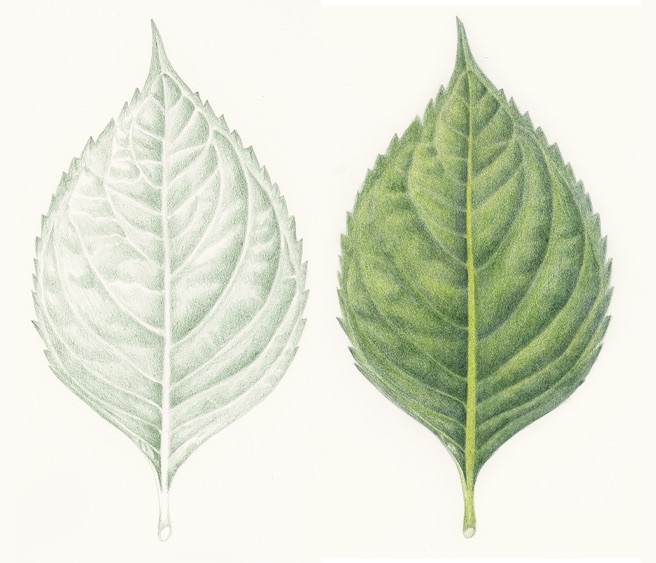 In this mainly colored pencil workshop, you will get an introduction to understanding the vein structure of leaves, and also learn a step-by-step approach to drawing leaves curling in space, along with many other interesting facts and characteristics of leaves. Students will complete a realistic rendering, showing the subtle value changes that represent the \"hills and valleys\" of the top surface of a leaf. Janet earned the NY Botanical Garden's Botanical Art certificate in May 2015. A 1989 graduate of Parsons School of Design, she has worked as an editorial art director and graphic designer for many magazines and book publishers, including Newsweek, Workman Publishing and until 2012, Tin House. A few years after a move from New York to Portland, Oregon in 2009, she discovered fellow botanical art lovers in the area and helped form Oregon Botanical Artists, now an active group there (www.oba-artists.com). She currently teaches Botanical Drawing classes at Oregon College of Art and Craft and Oregon Society of Artists. • Drawing board with a smooth surface (best size would be about 16 x 20\"
* Please note: students will return most of the tools to me at the end of the workshop, with the exception of all of the paper provided, and the folder with handouts and a few other misc. items.